Centropyge tibicen (Cuvier 1831), the Keyhole Pygmy Angel (2). Some folks have had better success with this species than I and my associates. Start with a mid-sized specimen, 3-4". Indo-west Pacific. One down in Wakatobi, S. Sulawesi, Indo. 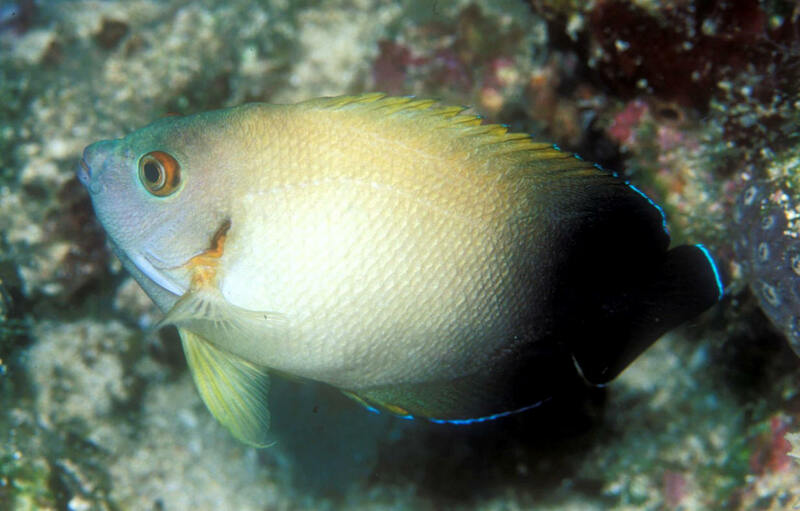 Centropyge venustus (Yasuda & Tominaga 1969), Venustus, Purple-Mask or Blue-Backed Angelfish (3). Now placed in the genus Sumireyakko, and mis-placed by some authors in the genus Paracentropyge. Western Pacific rim. To five inches in length. Aquarium pic. Centropyge vroliki (Bleeker 1853), the Pearl-Scaled or Half-Black Dwarf Angel (1), is one of my standard, "marine aquarium service account species". Very hardy. Indo-west Pacific Ocean in distribution. Closely related to, and hybridizes with Centropyge flavissimus and Centropyge eibli. N. Sulawesi pix. Centropyge bicolor (Bloch 1787), the Blue-and-Gold, Pacific Rock Beauty, Bicolor or Oriole Dwarf Angel (3), is highly variable in it's survivability in captivity. Some shipments are 100% live on arrival, others can be just the opposite within days. Better specimens come from other than the Philippines or Indonesia. To 6" if they live. Bali 2016.